Toronto Marlies goaltender James Reimer took the time to sit down with Oye! Times reporter Aman Dhanoa for a Q & A session to discuss his love of hockey and his journey from a small town to the big leagues. 22 year-old James Reimer is a talented young goaltending prospect that is starting to turn heads and get noticed in the AHL. At 6’2, 208 pounds, Reimer looks rather imposing in goal as his size gives opponents very little to shoot at. 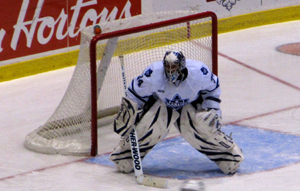 Reimer was drafted by the Toronto Maple Leafs 99th overall in the 2006 NHL Entry Draft from the Red Deer Rebels of the WCHL. He played most of last season with the Leafs’ ECHL affiliate, the Reading Royals. Reimer was called up by the Toronto Marlies for 3 games where he posted a 1-2 record, the lone win being a shutout. In a strange twist Reimer was traded/loaned on trade deadline day to another ECHL team, the playoff-bound South Carolina Stingrays, who had already gone through eight different goaltenders that season. The move was made to give Reimer more playoff experience and it paid off. The Stingrays were finally able the cover the puck line. 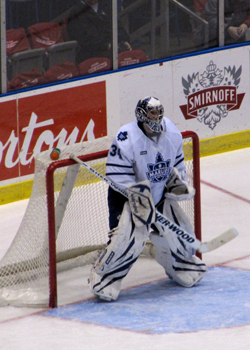 Reimer helped the Stingrays win the Kelly Cup in game 7 and earned MVP honours in the finals. Aside from a two-week emergency call-up to the Leafs, Reimer has spent this entire season with the Toronto Marlies but he did miss significant time due to an ankle injury suffered in November. Since making his return he has split the starting duties with Joey MacDonald and has played extremely well in helping the Marlies get back into the playoff picture. I grew up in Morweena, Manitoba. It’s a small farming community, it has about 125 people. It’s an hour and a half North from Winnipeg. That’s certainly a small town. Did you have to drive to different rinks outside of Morweena? It’s barely a town. It has a church and a school and had a little store but now the store shut down. I had to drive 15-20 minutes to a town called Arborg to play my minor hockey. Being from a small town, how does it feel to live in such a big city like Toronto? You kind of get used to it but I’ve kind of been eased into it. In junior, it was a town of Red Deer about 80-90,000 and in Reading was about 100,000. And when I was down in South Carolina it was probably 120,000. I kind of got eased into it but I’ve enjoyed it so far. It’s definitely a different lifestyle, everything is a lot busier, more rush, rush. It’s something I got used to. How old were you when you started playing hockey? I started playing organized hockey when I was 12 but probably like any Canadian I started skating when I was 3 or 4. Was there a particular moment in your life when you knew you wanted to be a hockey player? I think it’s just one of those childhood dreams that became more real with every year that went on. I think I remember my grade one yearbook, I said I wanted to be a hockey player. It became more real when I was 16 or 17 playing junior. Do you have a favourite childhood hockey memory? As a kid growing up we didn’t have one of the strongest teams so I didn’t have too many personal experiences but probably playing in the Director’s Cup. It was my first tryout based team that I had made and we had played in a tournament in front of a bunch of scouts so that was probably my favourite memory. Who was your favourite player or what players did you look up to growing up? I was a big fan of Mario Lemieux for forwards and goalies it was Mike Richter and Eddie Belfour. What has been your greatest hockey moment so far? Probably winning the ECHL championship last year, I got traded to South Carolina and we ended up going all the way. It was a lot of fun. You were drafted and signed by the Toronto Maple Leafs, how does it feel to be part of the Maple Leafs organization? It’s a lot of fun. Like I said I was an Eddie Belfour fan and some of his last years he played in Toronto, so I became a Toronto fan. To be drafted to the team where your favourite goalie plays for was exciting and it’s a great organization. It’s been a lot of fun playing here so far this year. Although you weren’t able to get any playing time, how did it feel to be called up by the Leafs early in the season? It was exciting. I wasn’t expecting it, especially that early. It’s unfortunate that both guys (Vesa Toskala and Jonas Gustavsson) got hurt but I tried to take advantage of it, I was kind of living a dream for twelve days, so it was really exciting. Your teammate Andre Deveaux is very superstitious and is very particular as to what he does before a game, do you have any pre-game rituals? I can’t say I have a superstition, but I do have a routine the way I do things. But if something screws it up, it’s not like I’m messed up in the head. I usually eat the same things, I usually have a couple of chicken breasts and a couple of baked potatoes but I switch it up sometimes. What part of your game do you excel at but don’t get much credit for? I try to pride myself in being controlled or even the mental side of the game, not letting goals bother you or bad plays or penalties and just staying focused and not worrying about any of other things around me. What nicknames do you have or what nicknames have your teammates given you? The only I got is Reims, it’s pretty simple, pretty straight forward. Did you pick # 34 or was your jersey number given to you? The team gave it to me. I’m not picky about my numbers. I like the number 30, but honestly I don’t really care which number I have. It’s probably a toss-up between Gladiator, Braveheart or Dumb and Dumber. Everything really, from Christian music to different types of contemporary music – whatever is on the radio. My dad owns a house moving business so my first job was working for him a couple of hours every day, a couple days of week just helping him, either in the shop or once in a while in the summer going along with him on the job. What are some of your hobbies and what do you like to do when you’re not playing hockey? One of my favourite sports growing up was soccer so I enjoy playing soccer. I also a swim a bit, I was a lifeguard. But when it comes down to it I just love playing hockey so with a bunch of guys whenever we have time we get together and play some floor hockey or road hockey or anything. I’m a big hockey fan whether I’m playing it on the ice in front of a bunch of people or just with my buddies.